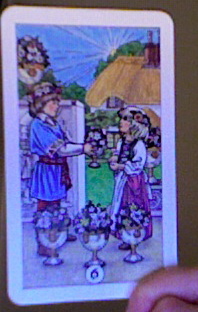 The tarot of the 6 of Cups can be considered a double mirror card. It's meaning can be that from the past or that of the future which makes it confusing at times. This one pictured is from the Robin Wood deck. Meaning= childhood, home, memories, innocence, youthful idealism, things that have happened long ago, a hero, renewal, and something soon to appear. Cups are connected to emotions, and usually with dreams or water.